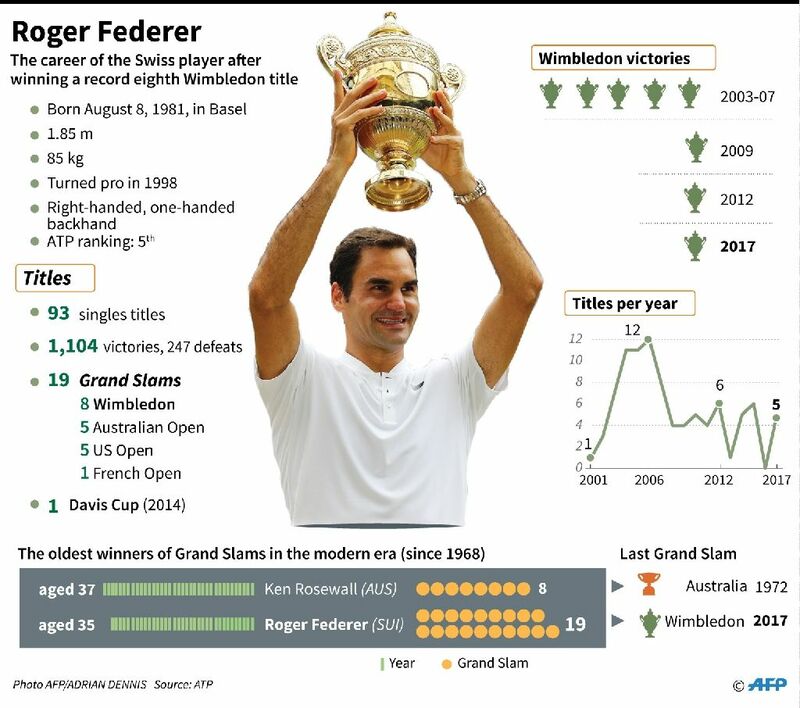 Federer claimed his 19th Grand Slam title 6-3, 6-1, 6-4 and at 35 is Wimbledon's oldest men's winner of the modern era, succeeding Arthur Ashe, who was almost 32 when he won in 1975. He had his left foot taped at the end of the second set but it was in vain as Federer became the first player since Bjorn Borg in 1976 to win Wimbledon without dropping a set in the entire tournament. "He's a hero," Federer said of his opponent. Twelve months ago, Federer was defeated in five sets in the semi-finals by Milos Raonic and promptly shut down his season to rest a knee injury. "It's disbelief I can achieve such heights. I wasn't sure I would ever be here in another final after last year," said Federer, who turns 36 in three weeks' time and who has now broken the tie for seven Wimbledon titles he shared with Pete Sampras and William Renshaw. "I had some tough ones in the finals, losing two against Novak (Djokovic). "But I always believed. I kept on believing and dreaming I could get back. "Here am I today with the eighth. It's fantastic, if you keep believing you can go far in your life." Federer won his 18th Slam in Australia in January on his return to the tour before adding the Indian Wells and Miami Masters back-to-back and a ninth Halle grasscourt title. He also skipped the entire claycourt season. "Iâve got to take more time off," joked Federer, playing in just his seventh event of the year. "I'll be gone again for the next six months! I don't know if it will work as well again." Cilic, who had spent four and a half hours more than Federer getting to the final, said a blister that he first suffered in his five-set win over Sam Querrey in the semi-final was to blame for his troubles. "I got a bad blister and fluid just came down under my callous in the foot," explained Cilic. "I still felt the pain. Every time I had to do a reaction fast, fast change of movement, I was unable to do that." However, Cilic explained that his courtside tears were for his emotional rather than physical pain. "It was just that feeling that I wasn't able to give my best," he said. It was saved by Federer and it was to be Cilic's only glimmer of hope. Federer then served up two love service games before claiming the opener 6-3 off a Cilic double fault, the Croatian's second of the final. Cilic dropped the set 6-1 and called a medical timeout to have his left foot bandaged and take a painkiller. His discomfort was reflected in his statistics. Federer pounced again with a break for 4-3 and wrapped up the one-sided final with a second serve ace to complete his coronation after just 1hr 41 minutes. Fittingly, he too wept at the end.